BoardGaming.com> Games> Card Games> Oh no… INVASION!!! Oh no… INVASION!!! is a cooperative game about a small community of Space Stations in some odd corner of the galaxy. The players star as the captains of these Stations who see their peace and quiet rudely disrupted when a Class-A Spawnmonster suddenly appears in their midst. This monstrous alien has nothing but bad intensions and players have little choice other than to stop panicking and start fighting. Working together closely exchanging weapons, ZAPPING aliens and building a smart infrastructure is the only way to stay alive. But staying alive won't cut it. At a certain point, the players will have to face the vicious Spawnmonster herself. Oh no… INVASION!! 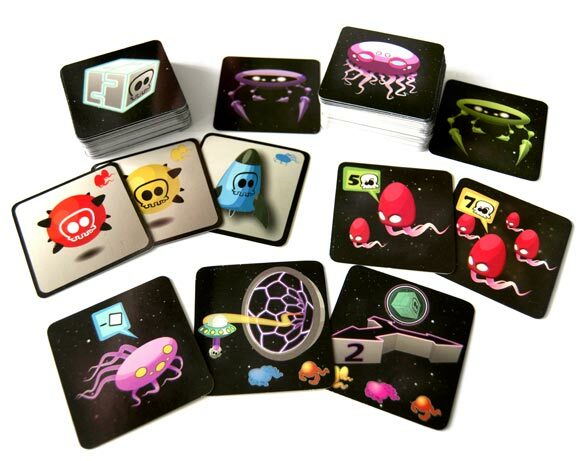 !, designed by Joost Das, is a card driven cooperative game for 3 to 5 players having about 20 to 45 minutes of fun. The game will spawn at the end of October at Essen 2012. Customize your profile with avatars from this game! The rules of play. Learn to play the entire game. Add a Review for "Oh no… INVASION!!!"